The coral reefs of Australia, particularly the Great Barrier Reef, Ningaloo Reef, and Lord Howe Island World Heritage Area are Australian national icons, of great economic, social, and aesthetic value to this country. Tourism on the Great Barrier Reef alone contributes approximately $5 billion annually to the nation’s economy. Income from recreational and commercial fishing on Australia’s tropical reefs contributes a further $400 million annually. Consequently, science-based management of coral reefs is a national priority. Globally, the welfare of 500 million people is closely linked to the goods and services provided by coral reef biodiversity. Uniquely among tropical and sub-tropical nations, Australia has extensive coral reefs, a small population of relatively wealthy and well-educated citizens, and well-developed infrastructure. Coral reef research is one area where Australia has the capability, indeed the obligation, to claim world-leadership. Australia punches well above its weight in the field of marine science. According to ISI Essential Science Indicators, James Cook University (JCU), The Australian Institute of Marine Science (AIMS), The Australian National University (ANU) and The University of Queensland (UQ) all rank among the top 15 research centres in the world (among 1644 institutions in 103 countries) for citations in coral reef science. 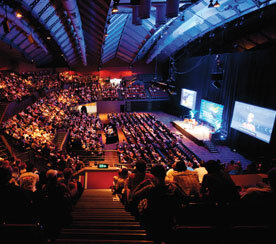 The Coral Reef Futures National Forum is co-sponsored by the Australian Academy of Science and the newly-created ARC Centre of Excellence for Coral Reef Studies. The ARC Centre of Excellence is headquartered at JCU, in partnership with UQ, AIMS, ANU and 23 overseas institutions. It is the largest provider of graduate research training in coral reef science in the world, producing well over 100 peer-reviewed publications each year. Our objective is to present (to a general audience) the latest science which supports the sustainable management of coral reefs, in Australia, our region, and globally. Key issues will include climate change, ocean acidification, fisheries management, conservation planning, capacity building, ecosystem-based management and adaptive governance. We have scheduled two events in the Shine Dome: a 2-day symposium with 6 sessions of 15-20 minute talks by leading scientists and policy makers, and an evening public event chaired by Robyn Williams. The symposium is aimed at a general audience of scientists in related fields, natural resource managers, conservationists, and policy makers. The evening event is designed for the general public, teachers and school children (older than about 10). Topics include Nemo, sharks and global warming. Rapid (r)evolutions: Can reefs respond quickly enough? Line Bay et al. Jon Brodie is a Principal Research Officer in the Australian Centre for Tropical Freshwater Research specialising in water quality. Former roles include lecturer in chemistry at Queensland University of Technology and the University of the South Pacific, analytical chemist with CRA and manager of the Water Quality Research and Management Program of the Great Barrier Reef Marine Park Authority. For the last 20 years his interests have been in environmental research and consultancy and the management of marine and freshwater pollution. He has recently involved in a number of environmental projects overseas in the Middle East and the Pacific islands. Jon’s research interests are in the sources of pollutants in catchments; transport of pollutants to the marine environment; the dispersal of land-based pollutants in coastal and marine environments; and the effects of terrestrial pollutants on marine ecosystems. Howard Choat has a major interest in the population dynamics of reef fishes including groupers, parrot fishes surgeon fishes and sharks. He presently holds the position of Emeritus Professor of Marine Biology within the School of Marine and Tropical Biology, JCU. From 1986 until 2000 he was Head of the Department of Marine Biology until his retirement in December 2000. During this period he supervised over 30 PhD students on a variety of topics including age-based population dynamics of squid and reef fishes and reproductive biology of aggregate-spawning species such as groupers and parrot fishes. Since retirement he has continued research and supervision, most recently on the population dynamics and abundance patterns of reef sharks in association with WA Fisheries and the Smithsonian Institution. The work described in this forum was carried out in association with Dr.W.D.Robbins presently with NSW Fisheries. A/Professor Sean Connolly is a Chief Investigator and Program Leader with the ARC Centre of Excellence for Coral Reef Studies and an Associate Professor at James Cook University. He held a Postdoctoral Fellowship with the Research Training Group in the Analysis of Biological Diversification, University of Arizona, USA (1999-2000). His research interests include marine community ecology, theoretical & statistical modelling, biogeography/macroecology, physiological ecology and paleobiology. Examples of ongoing research includes investigating the causes of patterns in coral reef biodiversity, the effects of no-take zones on fisheries productivity, and the population viability of reef sharks. He has recently been awarded a 5-year Australian Professorial Fellowship by the Australian Research Council, for a project that will use mathematical modelling to understand coral reef biodiversity. Professor Rocky de Nys is the Head of Aquaculture at James Cook University. His research, and that of the team within aquaculture, focuses on the sustainable development of aquaculture in the tropics. This includes the increased productivity of developed aquaculture industries, the development of new industries, and the implementation and extension of industries into developing countries, so that they can be economically and socially profitable, as well as environmentally responsible. Rocky has an extensive research background across a range of aquaculture and marine biotechnology fields with both academic and industry experience. Professor Ove Hoegh-Guldberg is a Deputy Director in the ARC Centre of Excellence for Coral Reef Studies. He is the Director of the Centre for Marine Studies at University of Queensland, and Director of the Stanford-Australia Program at UQ. His research interests span a broad range of topics including marine biology, evolution, physiology, biochemistry and molecular biology of plant-animal symbioses, co-evolution, coral bleaching and climate change. Ove is Chair of the GEF/World Bank Working Group on Coral Bleaching and Related Ecological disturbances, one of six expert groups within the IOC and World Bank Coastal Program’s Global Coral Reef Targeted Research and Capacity Building Project. Ove has published over 90 papers, including 6 in Science or Nature. Professor Terry Hughes is the inaugural Director of the ARC Centre of Excellence for Coral Reef Studies and a Federation Fellow (2002-2012). He has broad research interests in ecology, marine biology and the dynamics of coral reefs and in the past year, he has worked closely on the socio-ecological resilience of coral reefs. He has published over 70 influential scientific papers on the biology of coral reefs, including 17 papers in Science and Nature. Terry was elected a Fellow of the Australian Academy of Sciences in 2001 in recognition of “a career which has significantly advanced the world’s store of scientific knowledge”. Terry recently won the 2007 Sherman Eureka Prize for Environmental Research for “science for sustainable management of coral reefs”. Professor Malcolm McCulloch is a Deputy Director of the ARC Centre of Excellence for Coral Reef Studies. He is the Professor of Earth Environment, Research School of Earth Sciences, at The Australian National University, Canberra. His research interests focus on the modern part of the geologic record using isotopic and trace element geochemical methods to determine how climate and anthropogenic processes have influenced both past and present environments. Malcolm has received a number of awards including Fellowships of the Australian Academy of Science (2004) and the American Geophysical Union (2002). His 185 scientific papers have been published in leading international journals including 18 in Science and Nature. A/Professor John Quiggin is an Australian Research Council Federation Fellow in Economics and Political Science at the University of Queensland. Professor Quiggin is prominent both as a research economist and as a commentator on Australian economic policy. He has published over 750 research articles, books and reports in fields including risk analysis, production economics, and environmental economics. He has also written on policy topics including unemployment policy, micro-economic reform, privatisation, competitive tendering, and sustainable management of the Murray-Darling system. He was awarded the Thomson ISI Australian Citation Laureate for Economics in 2004. He is a Fellow of the Australian Social Science Academy, the American Agricultural Economics Association, and the Australian Institute of Company Directors, and a Distinguished Fellow of the Australian Agricultural and Resource Economics Society. (Ph.D. 1982, The Johns Hopkins University, USA) is a Professor of Oceanography, Marine Biology and Marine Policy in the University of Maine’s School of Marine Sciences. He is a marine ecologist who studies subarctic kelp forest ecosystems and coral reefs of the Tropical Caribbean Sea and Indo-Pacific Ocean. His research sites include the Gulf of Maine, the Pacific Northwest, Alaska’s Aleutian Islands, the Caribbean, the Great Barrier Reef, and coastal ecosystems of Brazil, Chile, South Africa, Papua New Guinea, Guam and Palau. Bob’s field-oriented research has resulted in more than 85 peer-reviewed publications. 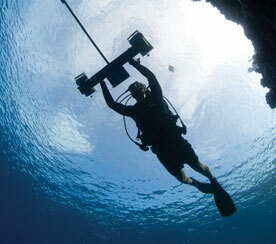 His current efforts are focused on improving the resilience of Mesoamerican coral reef ecosystems. John Tanzer is currently an Executive Director at The Great Barrier Reef Marine Park Authority based in Townsville. He has responsibility for two of the Authority’s key policy and management groups: Fisheries and Conservation, Heritage & Indigenous Partnerships. He also has responsibility for the Field Management, Legal, Ministerial Liaison Office, International Affairs, Community Partnerships and Corporate Services Group of the Authority. In recent times he has overseen the development of the rezoning of the Park, which has seen the highly protected area increased from 4.5% to around 33%. Prior to joining the Authority, early in 1998, he was the Chair of the Queensland Fisheries Management Authority. He has worked in natural resource management and policy since graduating with an honours degree in Geography in 1980. He also has a Masters of Environmental Law degree from Australian National University. Dennis Trewin, former Australian Statistician, was head of the Australian Bureau of Statistics from July 2000 until January 2007. He is now working as a statistical consultant and has undertaken contracts for the United Nations, World Bank, OECD and the Governments of Brazil, Korea and New Zealand. He holds other senior appointments in Australia such as an Australian Electoral Commissioner and a member of the Australian State of the Environment Committee for the last 9 years. He is currently Chairman of the Advisory Board of the ARC Centre of Excellence for Coral Reef Studies. He has recently been appointed as a member of the Board of the Australian Reward and Investment Alliance. Internationally, he has been President of the International Statistical Institute having previously been Vice-President and President of the International Association of Survey Statisticians. He is a past Editor of the International Statistical Review. He was also a past President of the Statistical Society of Australia. He is Chairman of the Global Executive Board of the World Bank’s International Comparison Program. He has been awarded an AO for his contribution to Australian and international statistics. Dr Wright is First Assistant Secretary and Executive Policy Adviser to the Secretary of the Department of the Environment and Water Resources. She has over 25 years experience in government in policy and program delivery ranging from the Health and Agriculture portfolios to Finance and Environment Dr Wright has a background in Applied Science and is a Fellow Certified Practising Accountant. Dr Wright headed up the Secretariat for the 2006 Review of the Great Barrier Reef Marine Park Act 1975 and is currently responsible for the implementation of the Government’s response. A superb communicator whose penetrating interpretations are enhanced by his lively wit, Robyn Williams specialises in demystifying science and technology. A successful author, Robyn is also the only journalist to be elected a fellow of the Australian Academy of Science. Deliberately provocative and sometimes offbeat, Robyn’s unique mix of humour and fact is both stimulating and entertaining. Robyn Williams has presented The Science Show on ABC Radio National since it began in 1975 – this could be a record. His other weekly programs on ABC Radio are In Conversation and Ockham’s Razor. Dr Janice Lough is a Principal Research Scientist leading the Responding to Climate Change Team at the Australian Institute of Marine Science and a Partner Investigator with the ARC Centre of Excellence for Reef Studies. Trained as a climatologist at the Climate Research Unit (UK), her research interests focus on understanding the nature, causes and impacts of climate variability and climate change in tropical marine environments. She also specializes in obtaining historical perspectives on coral reefs and the significance of currently observed changes using the rich archive of proxy environmental information contained in long-lived massive coral skeletons. How do Green Zones on the Great Barrier Reef work? Professor Garry Russ is a Chief Investigator and Program Leader with the ARC Centre of Excellence for Coral Reef Studies. His research interests focus on use of no-take marine reserves as conservation and fisheries management tools. 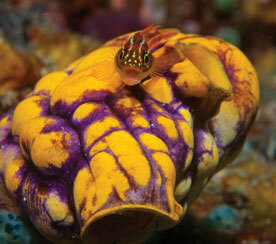 He has worked on Australian and Philippine coral reefs for 25 years. Russ was a Queens Fellow at the Australian Institute of Marine Science from 1982-1986. Garry moved to JCU 1988 where he is currently a Professor in Marine Biology. In 1999 he received a prestigious PEW fellowship in Marine Conservation. 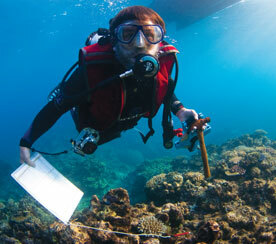 Dr Glenn Almany is a Research Fellow in the ARC Centre of Excellence for Coral Reef Studies. His current research focuses on larval tagging studies of coral reef fishes. The goal of his work is to provide information on how fish populations are connected through the movement of larvae. This information is critically important for the effective management and conservation of fish populations. Originally from Los Angeles, California, Glenn spent six years in the U.S. Navy as a nuclear reactor engineer on a submarine (1985-1991) and has a PhD in Zoology from Oregon State University (2002). He received a Fulbright Scholarship and NSF Postdoctoral Fellowship to join the staff at James Cook University in 2002. Professor David Bellwood is a Chief Investigator in the ARC Centre of Excellence for Coral Reef Studies. He has held positions in Ministry of Agriculture, Fisheries and Food (UK), the Natural History Museum (London) and Silliman University (Philippines). David’s research encompasses biogeography, paleoecology, biomechanics and behavioural ecology. His primary interests focus on the role of fishes on coral reefs and the relationship between species diversity and ecosystem function at global scales.